Maria Concepcion, a master instructor and practitioner at the Beau Institute of Permanent & Corrective Cosmetics, performs an areola restoration on Barbara Mische in her Mount Laurel office. In recognition of Breast Cancer Awareness Month, a local permanent makeup business celebrated breast cancer survivors on Thursday by offering complimentary three-dimensional areola tattooing for women who have undergone post-mastectomy reconstructive surgery. Beau Institute's eighth annual Beau Day of Hope created a fun and light-hearted space for breast cancer survivors to mingle with other survivors, enjoy light refreshments and empower each other while revitalizing a part of themselves. Survivors could get a day of self-care and pampering as they had their areolas tattooed as a way to make them feel whole again after their breast cancer battle and reconstructive surgery. 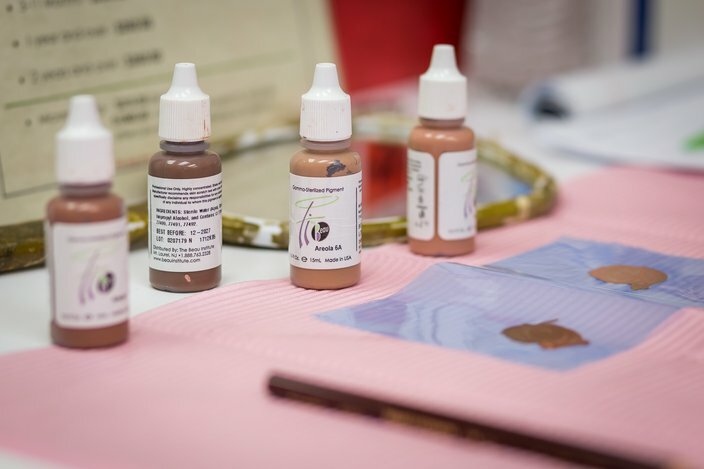 Ink used in the areola restoration tattoos at the Beau Institute. The Mount Laurel center, which provides and trains practitioners in permanent and corrective cosmetics, is striving to spread the word about the opportunity for survivors to normalize their breasts for a confidence boost. Using a digital pen, similar to a tattoo gun but with a finer needle, Maria Concepcion of the Beau Institute performs an areola restoration on a patient, Thursday, Oct. 18, 2018. Survivors can also get free areola tattooing done for free once a month, as part of Beau's teacher training program. Women can choose to be a model for teachers in training, which would enable them to get that service for free. Anyone interested in this service, at any time, should contact Beau Institute via phone at 856-727-1411. In addition to the permanent makeup-style areola tattooing, Beau Institute specializes in scar camouflage, scalp tattooing, and microblading.